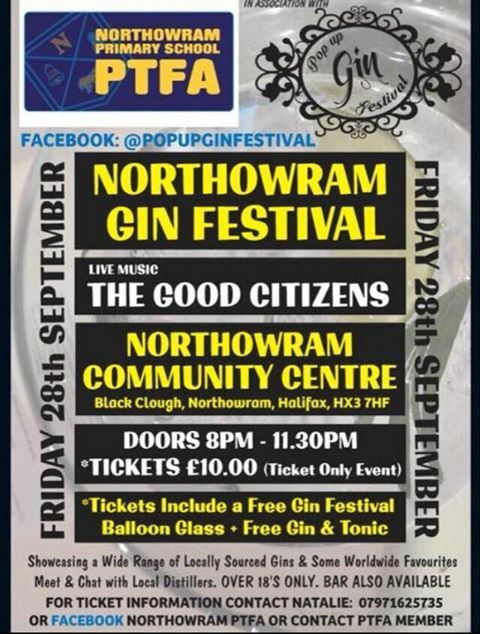 Northowram Primary School PTFA is please to announce that in association with pop up gin festival (as seen at Brodstock and Hipperholme gin festival), Northowram will be holding their very own gin festival on Friday 28 September, 8:00pm-11:30pm at Northowram Community Centre, Black Clough, Northowram HX3 7HF. Live music will be from ‘The Good Citizens‘, a three piece band bringing their own acoustic twist to cover songs and showcasing a wide range of locally sourced gins as well as worldwide favourites. Tickets are available at £10 which includes your first gin and a gin glass for you to keep! Tickets are limited so get yours ASAP as all previous events run by this company have been a sell out. This event is open to anyone and everyone and you do not need to have any links with the school. You just need to like gin, good music and also having a good time! (and be 18 or over). For further information contact Natalie on 07971 625735 or visit the PTFA Facebook page.